It seems as though summer holidays just started, but it's already mid July! Crazy how time flies. With that in mind, keep note, August is typically a slow time in the Real Estate Industry. We will take a look at our local neighbourhood for a better understanding. I will try my best to give you a detailed scoop of the current Real Estate Market in North Delta and Surrey, BC. The Real Estate Market in North Delta and Surrey is currently softening. We are in a midst of a transition called, The Hyper Supply Phase. What's that you may ask? It is 1 of the 4 phases in The Real Estate Market Cycle, as illustrated above in the flowchart. The cycle repeatedly circles back over and over a long term period of time. However, each of the these phases don't have solidified time period, which makes for unpredictable changes. The 4 phases include, Recovery, Expansion, Hyper Supply and Recession. Knowing what phase the market is in proves to be very helpful when deciding what actions to take for your home and financial position. Today, we will be discussing each of the 4 phases but more importantly the current phase we are in. Image by Glenn R. Miller, PhD. 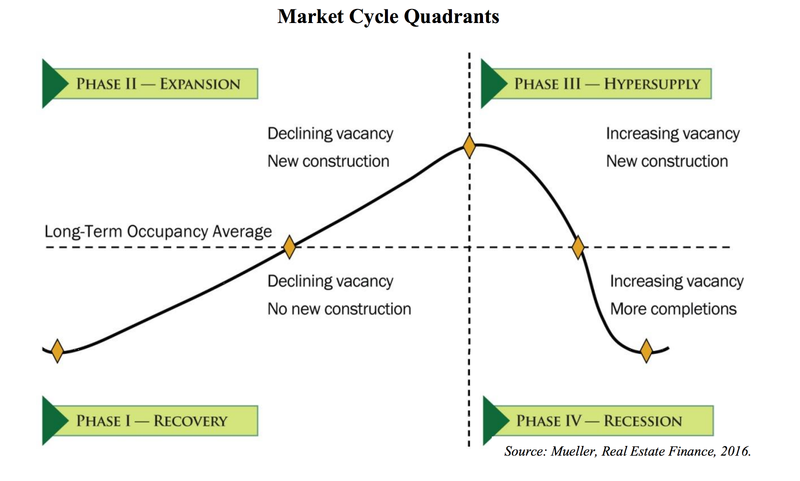 Here, is a single cycle of The Real Estate Market Cycle shown above. Taking a look at The Recovery Phase, it can be hard to identify, because the market still feels like it's in recession. In the Recovery Phase occupancy is at its lowest due to less demand for space, no new construction and rental rate growth either still or below the rate of inflation. However, this particular phase gives you the opportunity to buy bargain-priced properties which can turn into highly profitable investments. Moving on to the phase we are currently in, The Hyper Supply Phase. How does hyper supply even happen? The equilibrium between supply and demand in the Expansion Phase often tips over into excess supply. What does that mean? It means there are more homes on the market than there are buyers interested or active. An oversupply of space can be caused by overbuilding or pullback in demand caused by a shift in the economy. What does hyper supply entail? 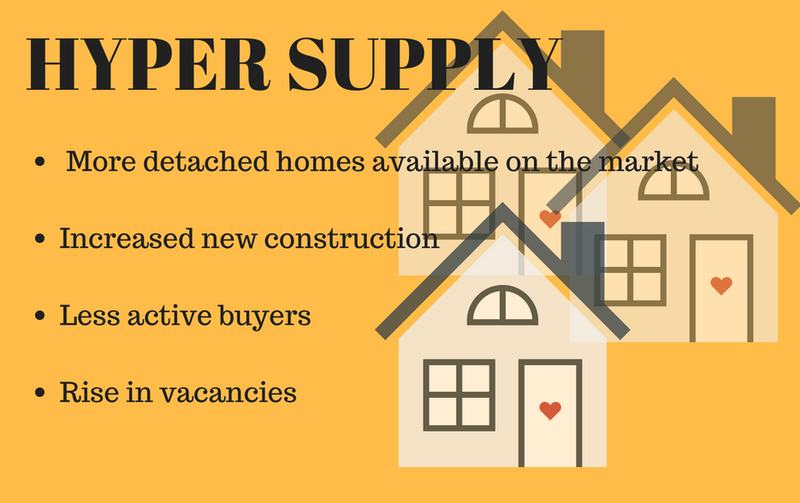 Hyper supply is marked by rising vacancies! Rent growth usually remains good but gradually declines. Therefore, before a difficult buyers market, you must decide, if you want to sell some assets before properties decline in value. If you take a step back and think about what you have observed in the last couple of years you will understand more thoroughly about how the cycle works. Let's compare by taking the numbers from 2015-2018 during the months of March-June, the graph below should help you visualize what is occurring during our beautiful British Columbia spring season when the market jumps up prior to declining. 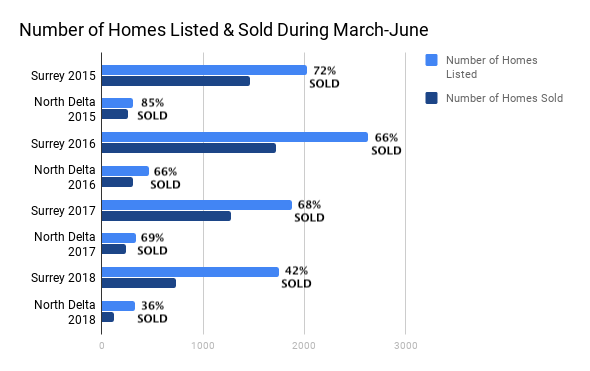 As you can clearly tell, there is a high influx of detached homes on the market and more than half are sold during each period. 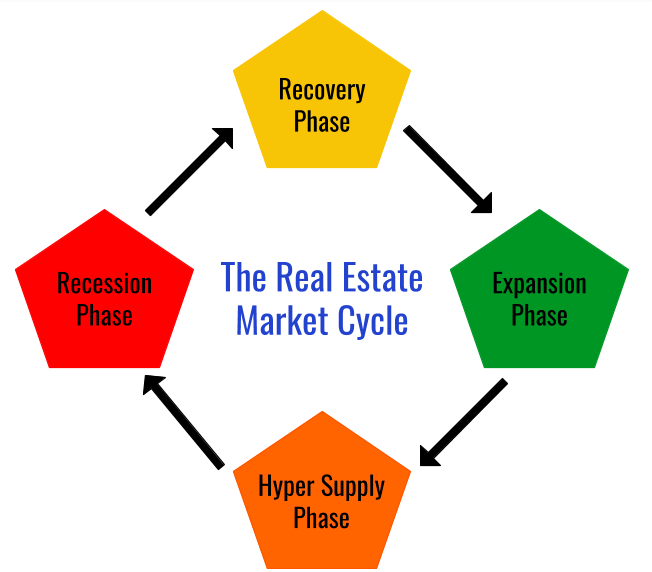 We are now in The Hyper Supply Phase of The Real Estate Market Cycle, and it will dictate how hard the impact of The Recession Phase in 2018 will be. Phase 4 of the cycle; The Recession Phase. How does it occur? Hyper Supply transitions to recession when occupancy falls below the long-term average. New construction will stop and projects that started before/during the hyper supply period will proceed and be completed. The excess supply of homes will become not only lower in rent but, occupancy as well. This is a very detrimental time for landowners because occupancy rates continue to lower throughout the phase and it is typical for revenue to fall below fixed costs...which means only one thing, foreclosures. Like any cycle, The Real Estate Market Cycle comes back to a full circle. However, during the Recovery Phase, only the well informed grab real estate for unbelievable market prices. We believe you should be one of the "well informed" before it's too late! Here at Sukh Brar Real Estate Group, we offer unbiased and trustworthy advice to help guide you throughout The Real Estate Market Cycle if you are looking to prepare. Don't hesitate to call us. We are your trusted and reliable local Realtors® in North Delta with over a decade of experience within the industry. Selling homes in North Delta and providing our clients with a quick and profitable sale is our number one goal. Good advice comes from those who have seen success. Please contact us if you have any questions or concerns regarding the cycle and your place in it! The following information is based on investment principles by the Real Estate Investment Network of Canada in good faith without warranty or liability for any incomplete or misleading information. Sukh Brar Real Estate Group is not responsible for the actions taken in reliance on the information contained neither in this publication nor for any errors contained therein or presented thereat or omissions in reaction thereto. Sukh Brar Real Estate Group hereby disclaims any and all liability to any person arising in respect of this information and of the consequences of anything done or purported to be done by any such person in reliance, whether in whole or part, upon the whole or any part of the contents of this information.